Jeremy Hellickson proved his value to the organization in his major league debut Monday night against the Twins. 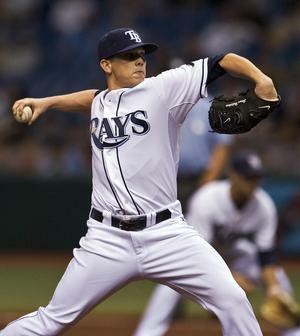 Hellickson picked up the win, pitching seven innings and allowing 2 runs on 3 hits with 6 strikeouts and 2 walks. He retired ten in a row to start the game before allowing his first baserunner with a walk in the top of the fourth inning. So has now proven he came make it in the big leagues, now its just a matter of time till he gets the call to stay. Following the game, Hellickson was optioned back to Durham. For more PitchFX data, visit Brook Baseball. While I shouldnt have been, I was shocked at how well he did and how cool and collected he acts. While it stinks he is back down already, as a Rays fan its a great thing to know we have a guy like this waiting in the wings ala Price in 08. I can see Helli coming up in Sept and helping the team out of the pen in the playoffs. So proud of Jeremy Hellickson!!!!! Was at the game last night and the only thing that scares me is his lack of leg drive. I noticed this in some youtube videos. When he's finishing his release he's almost in the standing up position. Completely the opposite if you compare his drive to Shields'. Jeremy seems to throw with primarily his upper body which is why he is able to control his pitches so well. I know it's late in the game to tweak his mechanics, especially when he is having this much success. It just scares me when I think about the long haul. Gonna bet that max CB of 90.7 is wrong, either a typo or a FB they put in the wrong category.